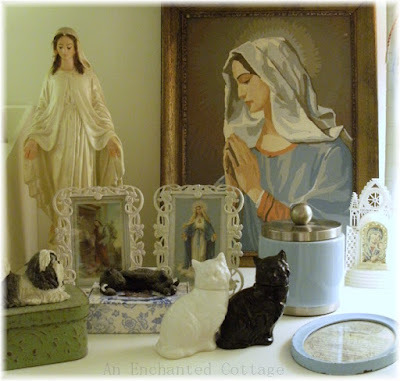 Last month I shared photos of my office/studio, including my shelf of Mary statues, paintings, and prints. 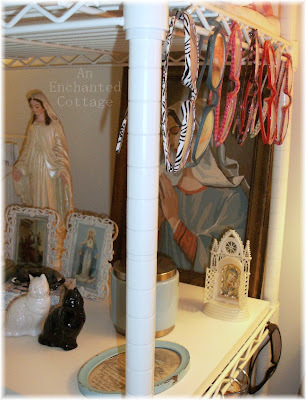 ...you'll see where I hang my reading glasses. ...because, as you can clearly see, I am prepared should I break (or lose) a pair of my readers! They are all lovely! And my mom also has that many pairs. Unlike you though we never know where most of them are! That's quite a collection of glasses! I have a few pairs of readers myself but not enough to call it a collection. Wow, that's a good collection! I had two pairs of glasses for about a week until my youngest snapped the arm off one of them! I remember that episode - Burgess Meredith sitting on the steps of the library - with no glasses! A nightmare of titanic proportions! I love seeing all your glasses in a row. Now if I could just get my husband to keep his all in one place. It seems that enormous amounts of time are spent here searching for his glasses. 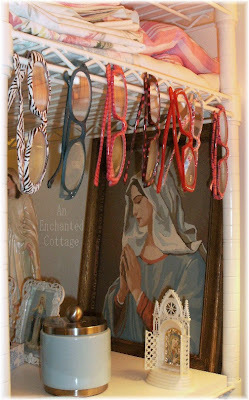 Well, you are certainly prepared for any kind of glasses problem...that's the way I am about sunglasses! I use to buy cute readers like yours, but alas, my old eyes need more than that now. 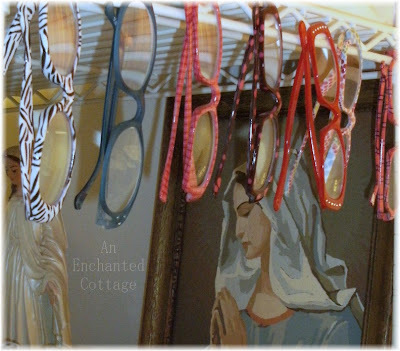 Now that is an eyeglass collection!! I like the black/white one, but they are all really cute!! Enjoyed looking at your post with the New England pictures. Maybe one day we can get up there, sigh.